Wooden Summer House - Who Has The Best? 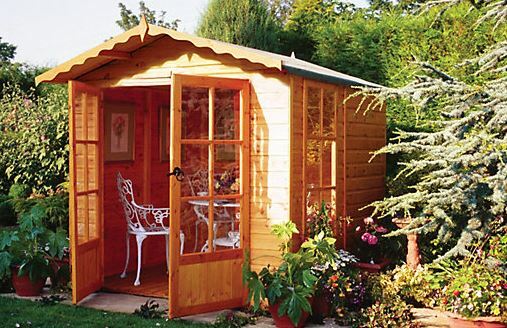 When it comes to garden buildings that are practical and yet elegant, a wooden summer house is hard to beat. They come in many different styles and sizes, with differing price points to match, but the one thing that unites them all is that they turn an unused space in your garden into a whole new room for your property. 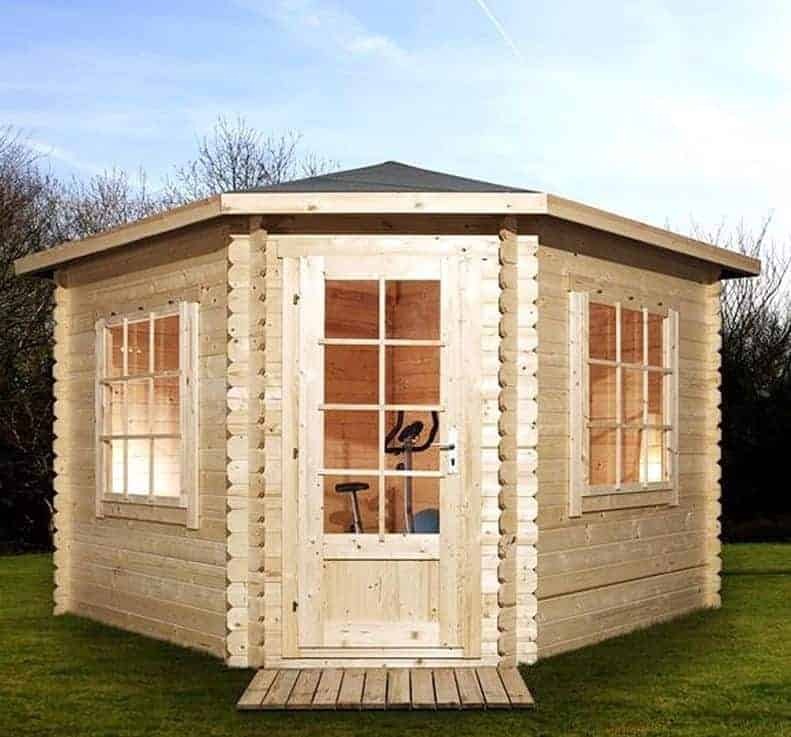 There’s so much you can do with a high quality timber summer house: it can be a place to entertain guests, a home office during the summer months, or simply a place to relax in and look out at your garden. Whatever you want it for, you can find your perfect match in our WhatShed guide to the top 20 wooden summer houses for sale online in the UK today. There was a lot of competition for places, so we took a lot into consideration when making our final choice. 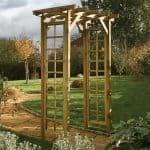 Size was important, but it was by no means the only factor, so you’ll find summer houses to fit all sizes of garden. Price was also a primary consideration, so even though you will find some luxury summer houses in this league table, you’ll also find budget level buildings that still have something special about them. Aesthetic appeal is also important when it comes to a summer house, as is toughness and durability, and all these factors and more were taken into account. Here then are the WhatShed 20 best wooden summer houses that can be bought online in the UK today. Congratulations to the BillyOh 5000 Eden Summer House, a big summer house with a lot to offer and ideal for either business or leisure purposes. 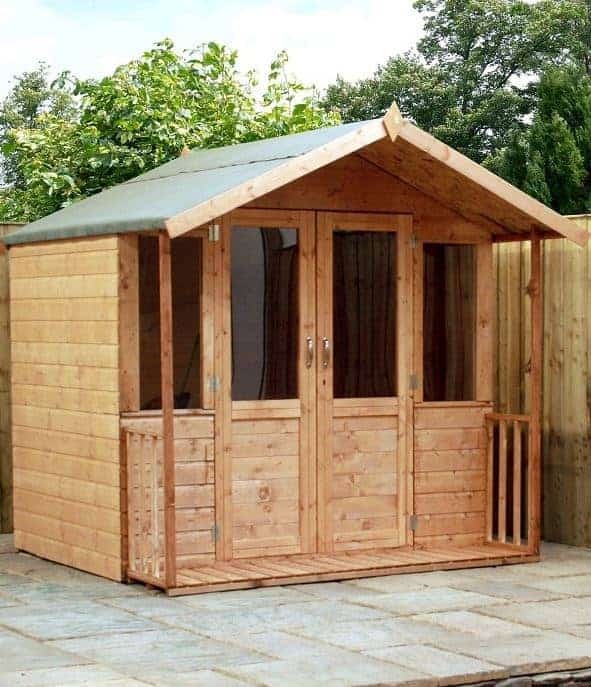 We know that not everybody will want a timber summer house as big as that of course, or want to spend upwards of a thousand pounds, which is why you’ll find wooden summer houses of all sizes and prices in our list. The one unifying factor is quality, and that’s something that we always look for in the garden buildings we review. 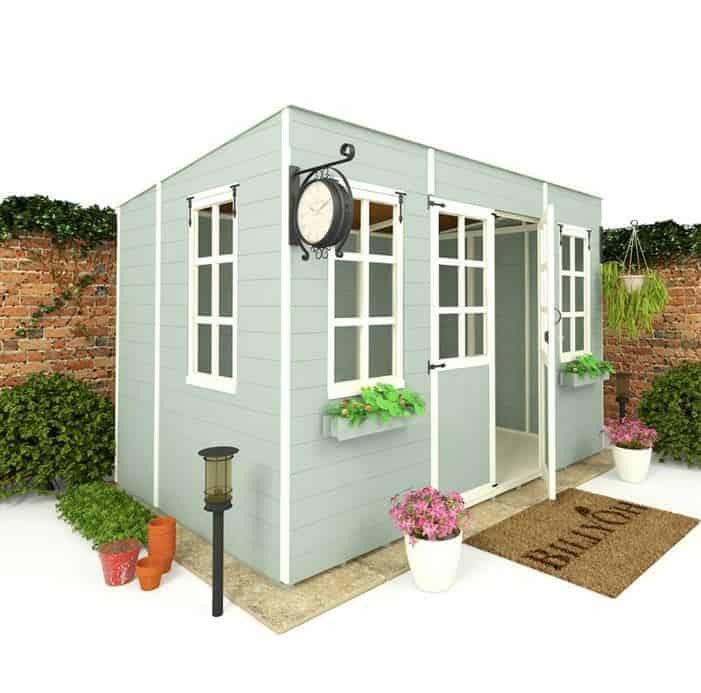 Whether you’re looking for a corner summer house, a lean to greenhouse, or a 6X4 shed, WhatShed bring you the reviews that will help you make an informed choice. This is by far the largest wooden summer house in our league table, with a base width of 5.90m, a base depth of 3.14m, and a ridge height supplied by the rain deflecting apex roof of 2.47m. We appreciate that this will be too large for some gardens, whilst others may prefer compact summer houses, so we didn’t judge it so highly based on its size alone. 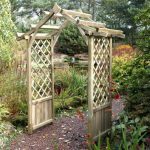 It does look a very impressive garden building, however, and despite costing over twelve hundred pounds it offers good value for money as well, so we have no hesitation in putting this at the very head of our list. This is a summer house that takes its stylistic cue from full sized houses, with a large double door entrance being right in the middle. You won’t have to worry about sunlight reaching the extremities either, because there are six styrene windows to give all round illumination, and all of them open. Despite its size there have been no cost cutting measures taken, so we were pleased to see tongue and groove cladding used throughout. It was also good to find a 10 year warranty provided, even though the customer will have to add extra coatings of wood preserver from time to time. It’s worth noting that the basic price doesn’t include a floor, but a premium floor can be added for £236. This still makes this very good value for money, and a worthy champion in our guide to the best wooden summer houses in the UK. When reviewing garden buildings we always welcome the additional touches and features that give extra value to the customer, and that’s why this unique building gains the number two position in our list of the very best wooden summer houses. In effect it’s two highly useful buildings in one, with a stylish glass fronted summer house taking up most of the space and then leading onto a side shed. This side section has no windows and has its own key operated single door, so it’s ideal for use as a secure storage area. This in turn means that the summer house area would be perfect for use as an office, with computing equipment being stored in the shed when not in use. Taking both components into consideration this is quite a large building, with a width of 3.65m and a depth of 2.43m, and it was good to see that tongue and groove cladding is used throughout and that it comes with a 10 year anti-rot guarantee. There’s lots of light inside to carry out work by, thanks to the glazing on the very wide opening bi-fold windows and two separate windows. By combining two functions in one, this becomes much more than just another wooden summer house, and that means it can also save you space and money if you were planning on buying the elements separately. 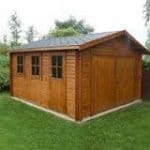 This is the most expensive summer house in this top twenty league table, and it’s certainly not one of the larger ones, and yet it is so tough and durable that we rate it as the third best wooden summer house for sale online in the UK today. It has the octagonal pavilion style design that we love, and the width of 1.75m and depth of 2.36m are just enough to place a comfortable chair and maybe a few items of electrical equipment inside. Whilst its good looks are reminiscent of the two other eight sided buildings in this list, it has other features that are completely unique among the summer houses that we’ve reviewed. The first indication of this comes with the cladding, which at 19mm is as tough as any other tongue and groove cladding that we see on similar buildings. The frame, however, at 63 X 38mm is by far the thickest that we’ve seen, and means that the structure as a whole feels very strong once assembled. A cutting edge tanaliser known as Tanalith E has also been applied, which gives very long lasting protection against rot and attack from insects such as woodworm. It also means that a 15 year warranty is given, which we were very glad to see, especially as it isn’t reliant upon regular re-treatments. It has a high price tag, but this is a wooden summer house that will last and last. 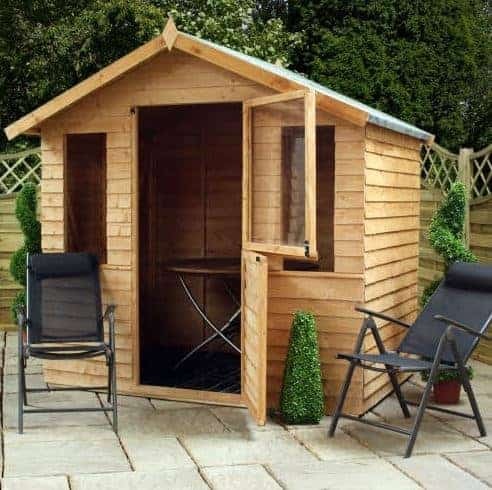 You might not expect to get a pressure treated summer house complete with a 15 year warranty against rot for around four hundred pounds, but thanks to this great value product from Hartwood that’s just what you have. The combination of these two factors of price and durability earn it a deserved spot just outside of our top three wooden summer houses in the UK today. That makes it the highest placed overlap cladding summer house in our league table, and whilst this cladding of 7mm is also the thinnest of all those that make our top twenty we appreciate that cost savings have to be made by the manufacturer to allow them to offer such an affordable building. Unusually then, the roof and the floor, which are both made of 8mm solid sheet material, are both thicker than the walls, but once assembled it feels solid and reliable. Our only caveat is that it might not be ideal for exposed areas that get a lot of strong winds. There are six styrene glazed panels, two in the single door and two in each of two windows, although again the styrene is thinner than we’re used to seeing. 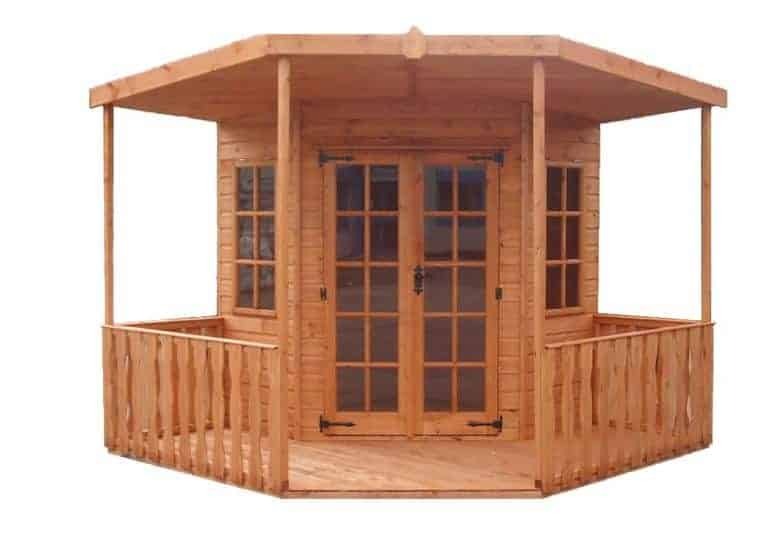 Nevertheless, the peace of mind given by the long warranty, and the long lasting protection of the pressure treatment, makes this an excellent compact wooden summer house. 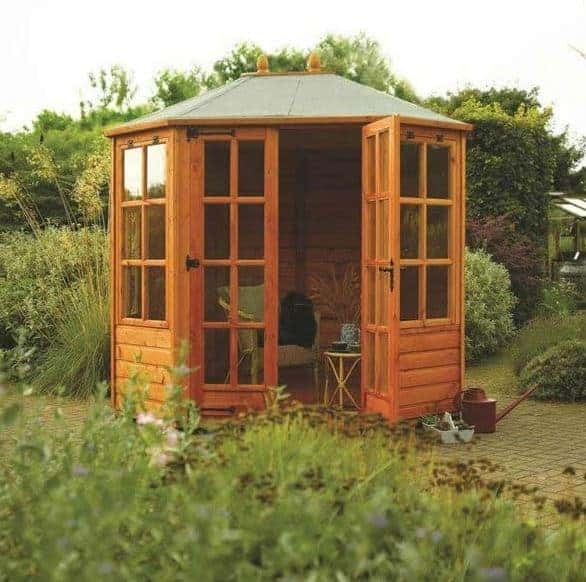 This is the second largest garden building in our WhatShed guide to the best wooden summer houses currently available, and so even though it has a price tag of nearly a thousand pounds we still feel that it represents good value for money as well as providing a lot of space. 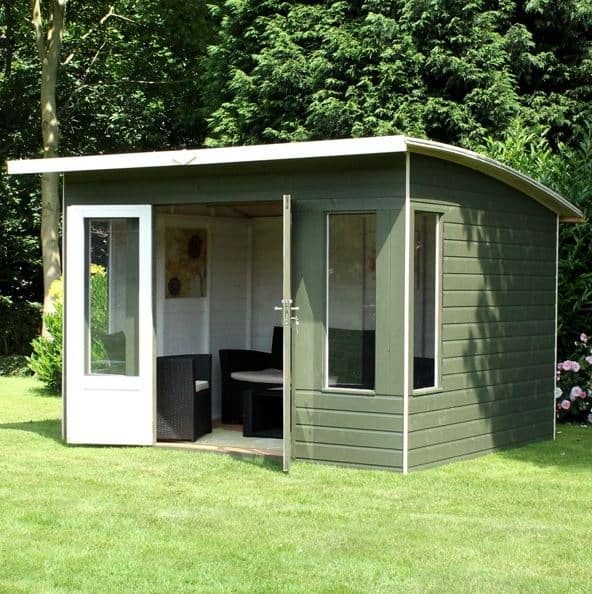 With added space comes added versatility, and with a base width of 3.13m and a base depth of 5.02m there’s more than enough room to use this as a large home office, or even as a handy and cost effective extension to your home. The large apex roof not only does a good job of keeping rainwater away, it also has an overhanging canopy that creates a shaded area out front. On the hottest days the three windows can all be opened as well, providing cooling air and ventilation. Premium quality tongue and groove cladding has been used throughout, which is important as it creates the stability needed with a garden building of this size, and extra reassurance is given through a 10 year warranty period against rot, although regular re-treatments will need to be carried out. 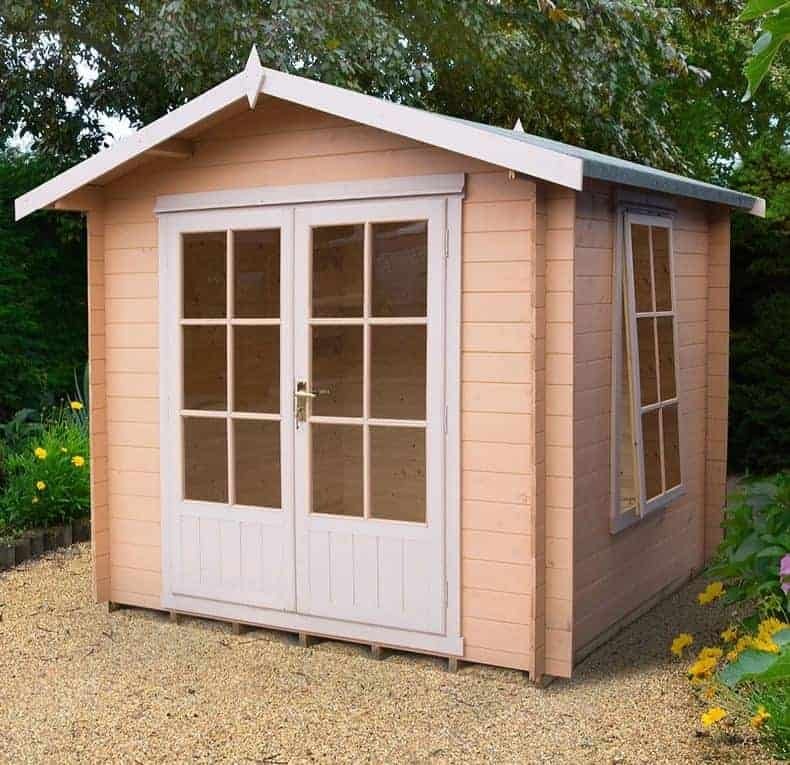 All in all, if you’re looking for a large wooden summer house but don’t want to spend too much this could be an ideal purchase. 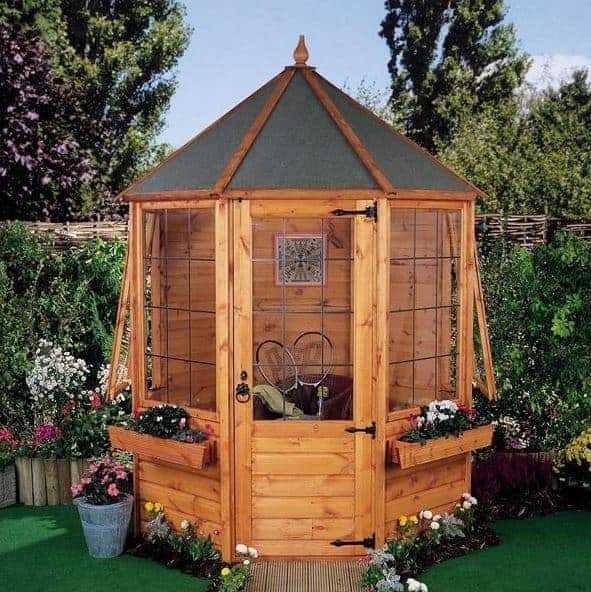 If you have a modern house and a modern garden to match, then it makes sense to have a modern wooden summer house too. That’s why this helios summer house has obtained such a high position in our league table, and for its size it represents relatively good value too. The first thing that struck us about its appearance was its curved roof; it’s a variation on the pent roof and yet looks very contemporary, and of course it’s just as effective when it comes to the task of carrying rainwater away. Underneath the unique roof there’s a lot of space for your money, with a base width of 2.94m and a base depth of 2.44m. The peak height of the roof is 2.12m, which is a little higher than we often find with some traditional pent roofs but due to the curve a little interior space is lost at the rear of the building. As you might expect with such a contemporary styled building there’s lots of glazing, both on the double doors and four further styrene windows. 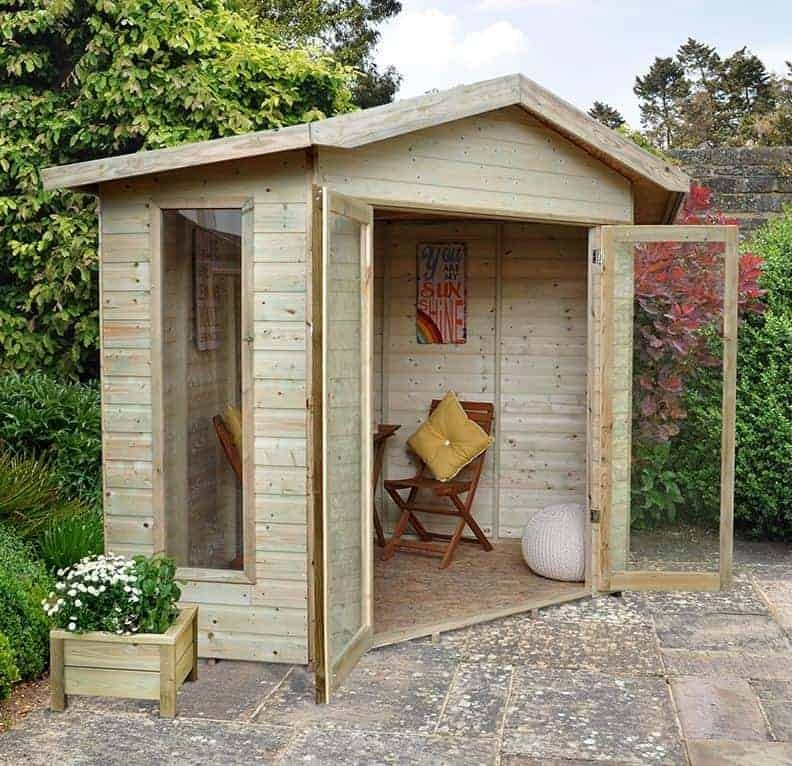 It comes with a 10 year warranty, and whilst that is a standard offering at this price, the appearance of this wooden summer house is anything but standard and for that reason it deserves to be considered by those looking for style as well as function. Even among the upper reaches of our list of the 20 best wooden summer houses in the UK today there’s still room for a great value garden building such as this one, even if it isn’t the most luxurious summer house that we’ve reviewed. It follows the very traditional rectangular design that we often see repeated, and the base area of 2.02 X 1.51m is principally suited to those with smaller gardens. Even so, it has some excellent features which we feel raise it above its competitors and make it worthy of its place in our top 10. Interlocking shiplap cladding has been used for the walls, and further weather protection is given by the apex roof which means that rainwater simply runs away. Even though the roof, like the floor, is made of thinner solid sheet material, it is covered by a strong felt and this should ensure that the contents of the interior are kept dry even in a storm. 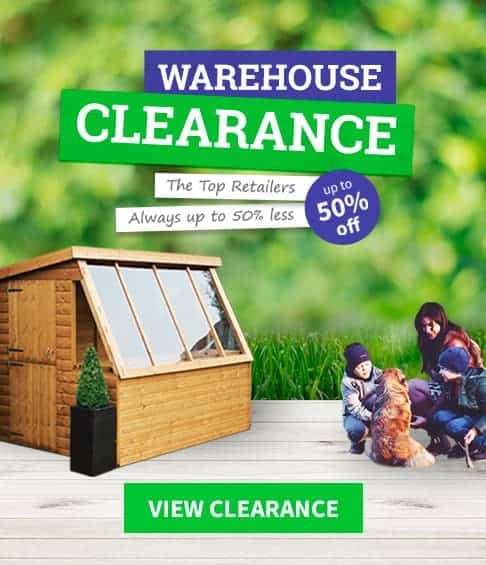 The best defence of all, however, is given by the pressure treatment that’s been applied to the warranty, and the 15 year warranty against rot provided here is as long as any that we’ve found on any wooden summer house at any price. One thing that people love about summer houses is the amount of sunlight that floods in on a summer day, bringing warmth as well as illumination. 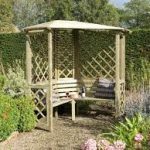 For sun worshippers looking for a safe place to relax in their garden on a hot day this could be a perfect purchase. The first thing that caught our eye about this apex roofed wooden summer house is the glass, or in this case safe and shatter resistant styrene, dominated frontage. The double doors are amongst the widest that we’ve seen, opening to 1.29m, and they are fully glazed. There are two side positioned windows as well, and whilst slightly smaller they still allow a lot of light to reach the interior. The base width is 3.32m and the base depth is 2.43m, but you won’t have to worry about finding too much space to fit it into as it’s designed to be positioned in a corner. With the emphasis on the styrene glazing it doesn’t have the decorative touches that many of the other wooden summer houses on this list have, yet it is worthy of its place in the top ten thanks to the pressure treatment that’s been applied to the tongue and groove cladding. It gives long lasting protection, and is the reason that the manufacturer has been able to give a very welcome 15 year warranty against rot. Octagonal summer houses have a lot of fans, as they replicate a look that encompasses all the style and elegance of the turn of the twentieth century. They inevitably lose a little interior space, thanks to the corners that make up the eight sides, but they are frequently some of the best looking garden buildings that we see, which is why this particular model is placed so highly in our list of the top 20 wooden summer houses. The door and four of the sides are glazed, which means that the person using the summer house will be given a great panoramic view of their garden. We were pleased to see the the windows are also top hinged and opening, as ventilation can come in very useful on a hot summer day. Underneath all the windows are window boxes, which is a little touch but one that we think helped to make its appearance even more charming. Another feature that we particularly liked is that the tongue and groove cladding used is 14mm thick, which is slightly thicker than most that we see on similarly sized garden buildings. At six foot by six foot it’s one of the more compact wooden summer houses on this list, but it is beautifully formed and with a 10 year anti-rot guarantee provided it’s durable too. We’ve reviewed lots of different models from the BillyOh range of summer houses, and they always feature high quality components and attractive styling. This pent sanctuary didn’t disappoint, and its original looks, in combination with a great value price tag of just under six hundred pounds, helped it to climb into the top ten of our list of the best wooden summer houses available to buy today. There’s a lot of summer house here for an affordable price, with the wide front measuring 2.97m backed up by a base depth of 1.88m. The ridge height is lower than many that we see, at 2.03m, but this is often the case with pent roofed garden buildings and it still feels comfortably spacious when moving around inside. Whilst solid sheet material is used for the felt covered roof, tongue and groove has been used for the floor just as it has for the roof so it feels like a solid structure once assembled. We were also pleased with the ten year warranty provided against rot, and the use of safe, if cheap, styrene glazing in the three windows and the half glazed double doors. 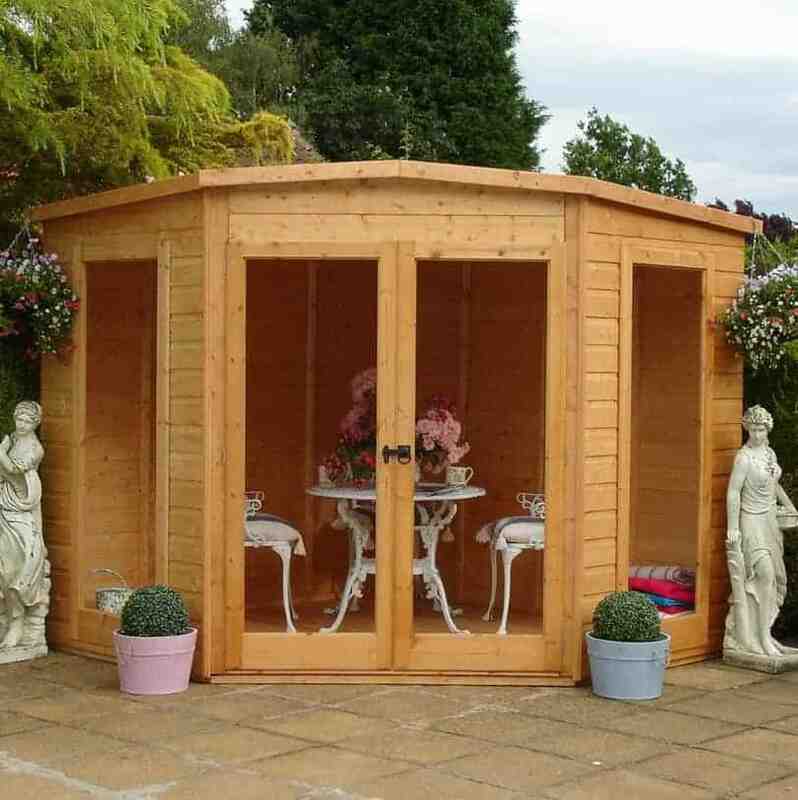 If you want a well sized wooden summer house that provides value too then this should be on your shortlist. Chatsworth House is renowned for its elegance, which is why we feel it’s a fitting name to be given to this very stylish wooden summer house. Size wise it fits neatly into the mid range of those which feature on our list of the twenty best, with a base width of 2.34 and a base depth of 1.87m, but it has a look all of its own and it’s one that we found very attractive. The first thing that catches the eye is that the front is dominated by glazing. The bi-fold double doors, which we were pleased to see came with a lock and key, feature six glazed panels in a Georgian design that takes up the upper half of the door. Alongside them are two similarly glazed windows and there are two more large windows around the side. This means that it not only looks very striking, the interior is flooded with light on a sunny day which makes it ideal for use as an office. Thought has been put into the design of the apex roof too, as it is truncated before its natural peak and has a two acorn shaped finials. 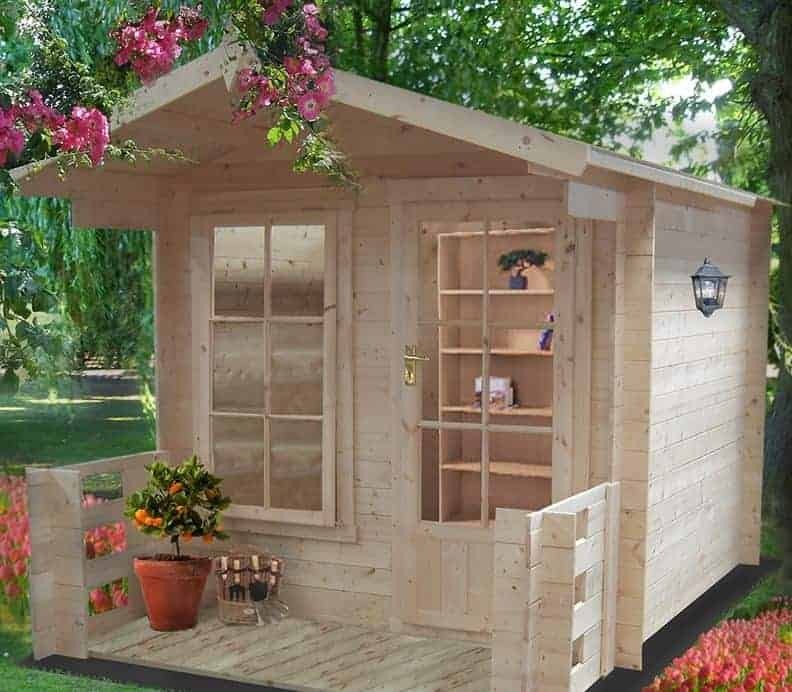 With a 10 year conditional warranty provided as well, this is a wooden summer house with a lot to recommend it even if it does come at a high price. Whilst this garden building features loglap cladding, where planed 28mm logs lock tightly together in the style of tongue and groove, we feel that owing to its size and design it deserves to be treated as a mid sized wooden summer house, and therefore is a deserved entry on our top 20 list. 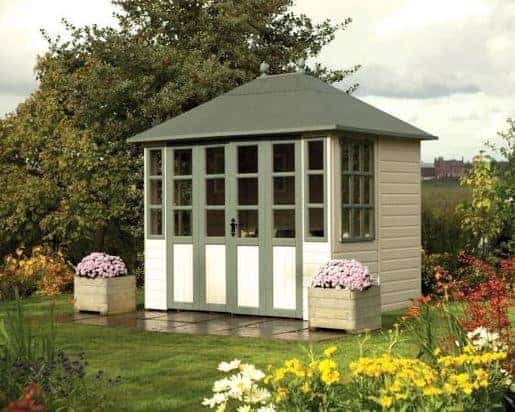 It’s one of the largest corner style summer houses that we’ve seen, with a width and depth of 3.00m and a ridge point at the top of the apex roof to match, and yet thanks to the five sided design it can fit unobtrusively into the corner of gardens of almost any size. One of the things that we liked most about this timber log cabin is just how strong and tough it is. The 28mm thick cladding is as thick as any that we’ve seen, and the corners also feature chalet connectors. 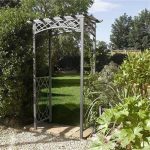 This creates a very stable and reliable structure, which we feel would be perfect for gardens that are often exposed to windy conditions. Horticultural glass has been used on the windows and on the glazed single door, and there’s also a key operated lock, so it’s also a secure environment from intruders. With a 10 year warranty included, only the high price tag stops this great wooden summer house being placed higher. 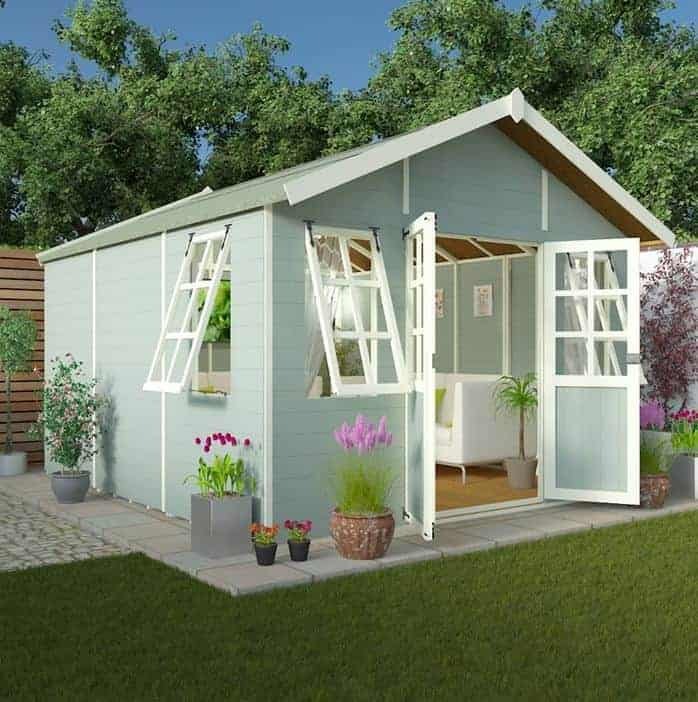 A high quality summer house creates a great new space in your garden that can be used for either business or leisure, but it doesn’t have to cost a lot as this great value building shows. 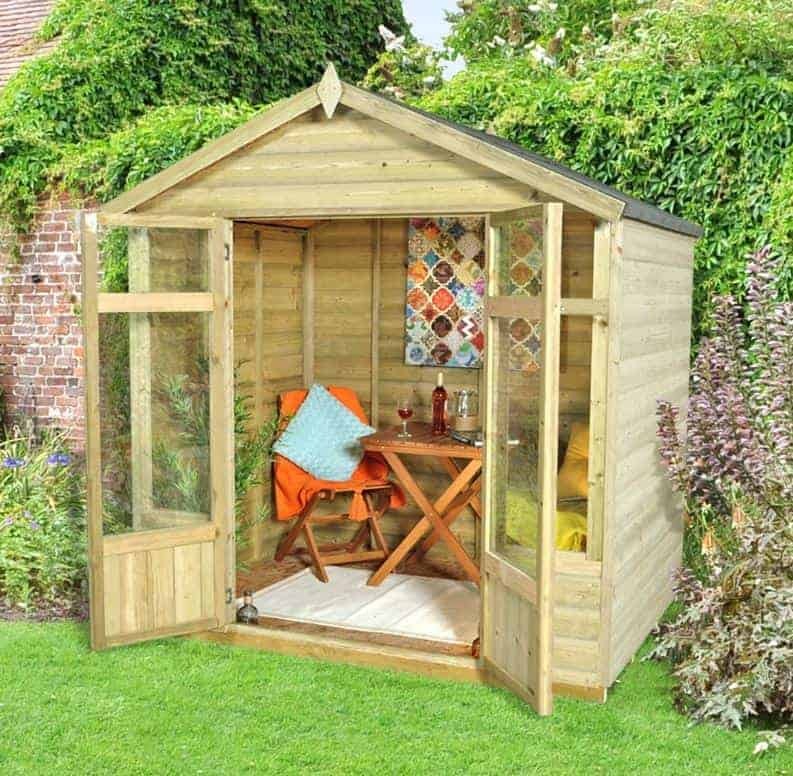 At significantly less than four hundred pounds, this is the cheapest wooden summer house in our top 20 table, and just because it’s affordable doesn’t mean that any corners have been cut by the manufacturer. This is shown by them providing a 10 year warranty against the appearance of damage caused by rot, which we feel adds even more value. It has 8mm overlap cladding, which whilst not as thick or strong as tongue and groove is much more cost effective and should still be tough enough for normal domestic usage. It follows the classic rectangular design with an apex roof, and has a base width of 2.23m with a base depth of 1.47m. One feature which made it stand out stylistically, however, is its stable door, with the separately opening top section being filled with shatter proof styrene glazing. There are two further styrene windows to the side of the door, so if you’re looking for a compact wooden summer house that’s full of light and that won’t cost a lot, this could be your ideal selection. We have another corner summer house here, and this one sticks very closely to the traditional design of a five sided building underneath a pent roof. Its base width and depth are both 2.05m, although the cutaway nature of a corner building means that you won’t be able to utilise all of this space in the interior. The ridge height of 2.20m, however, is quite tall for a pent roof, and so you won’t feel uncomfortable when walking around inside or have to duck too much when entering through the doors. The double doors take up the full width of one of the five sides, and they are fully glazed too. The two adjoining sides are also dominated by glazed windows, so the building as a whole has a very contemporary look. We were pleased to see that all the timber used in the building was tongue and groove timber, and with a slightly thicker than average frame it feels stable too. What elevates this particular building into our list of the top 20 wooden summer houses, however, is the inclusion of a 10 year warranty period, as long as the treatment schedule is adhered to, and its overall good value for money for a seven foot shiplap summer house. Corner summer houses have unique advantages in that they provide the benefits of a summer house whilst taking up comparatively less room in a garden. This great example of the genre also has a unique and attractive look, and it is this that secures its place among our list of the 20 best wooden summer houses available today. The feature which makes this unique among the pentagonal corner buildings that we’ve reviewed is that it features a canopied verandah that radiates out from the central summer house itself. The effect is visually striking, and very practical too. The nine foot by nine foot size of this summer house includes the verandah, and as this measures a uniform three feet all the way round you can see how compact the central building is. This too, however, we found very pleasing on the eye, with fully glazed double doors in a Georgian style and two side windows that open upwards. Shiplap cladding has been used throughout, and the supporting frame was one of the thickest and therefore strongest that we’ve seen, even on much larger garden buildings. There’s even a door drip to give added weather protection to the entranceway. 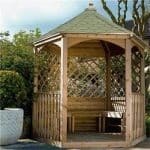 These high quality features ensure its place among the best wooden summer houses you can buy today. 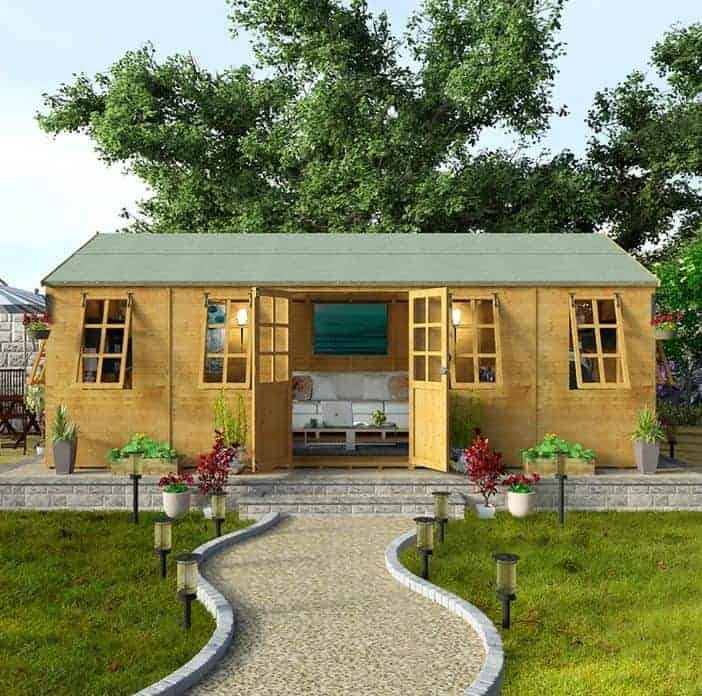 This is another garden building that imitates the style of a log cabin while offering the dimensions and affordability of a summer house. It’s very attractive too, and like the entry above the only thing that stops it from being higher up our list of the 20 best wooden summer houses is that it only comes with a one year warranty. If you’re prepared to spend the time and money adding your own wood preservative treatments then this should be much longer lasting, and in that case you should put this on your shortlist. The first thing that caught our eye when we were reviewing it was the extending 0.85m verandah. This is included in the base depth of 2.94m, and there is a base width of 2.09m. The verandah is a great place to entertain house guests or you can simply sit there on a comfortable chair watching the summer evening float by. 12mm tongue and groove cladding has been used throughout, which is something we always like to see, but we would have preferred to see a long lasting treatment applied to the cladding as well. On the plus side the single door, which is next to the one large window, has a key operated lock as standard which we don’t always find on other wooden summer houses. This may be self styled as a log cabin, but its looks, dimensions, and use of tongue and groove cladding mean that it is actually a summer house, and in our opinion one of the 20 best wooden summer houses for sale in the UK today. This is very much a mid sized example, with a base width of 2.09m and a base depth of 2.39m, underneath the apex roof which reaches to a peak height of 2.29m, but the wide opening double doors allow the owner to make the most of every inch that’s available. Alongside the glazing in the doors there are two side windows, and we were pleased to see that they can be opened to allow ventilation in, which can be a very useful feature if using the building as an office on a summer day. Another feature we approved of was the inclusion of integrated floor bearers that life the building above the threat posed by ground moisture. The tongue and groove cladding, at 19mm, is among the thickest we see on any wooden summer house, so it has great potential durability but the lack of any effective pre-treatment and the provision of only a one year warranty keeps it at the lower end of our top 20 list. This relatively compact summer house could never be called palatial but it does have a number of decorative features that made it stand out from the crowd a little, and which elevated it into our list of the 20 best wooden summer houses. The frontage is dominated by the wide double doors, so moving furniture or larger items in and out is easy, and there’s also an overhanging apex roof to give added protection from the elements. The roof itself has decorative edging, which we found to be a nice touch that enhances an already good looking building considering its affordable price point. There’s one side window as well, which is as large as the full length glazing on the doors, so lots of light reaches the interior. The base dimensions are 2.05 X 1.98m, and we were pleased to see that tongue and groove cladding had been used throughout instead of more cost effective options being used for the roof and the floor as we often see on summer houses that cost less than five hundred pounds. 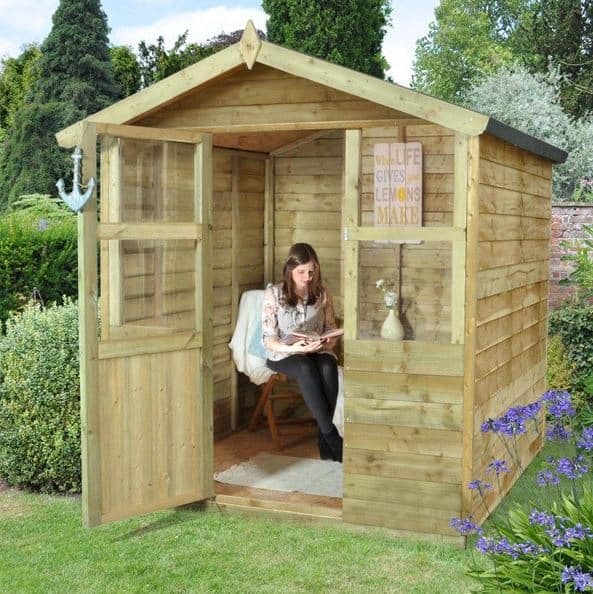 This isn’t the largest or most feature packed wooden summer house that we’ve seen, but it does represent good value and is well constructed from sustainably sourced pine and spruce. This is one of the smaller summer houses on our list, and yet that itself can make it an ideal choice for people whose space is at a premium in their garden. It follows the traditional rectangular design shared by many of the wooden summer houses that we review, but the overhanging apex roof creates a canopy effect at the front, giving extra space in the protection of the shade on a hot, sunny day. 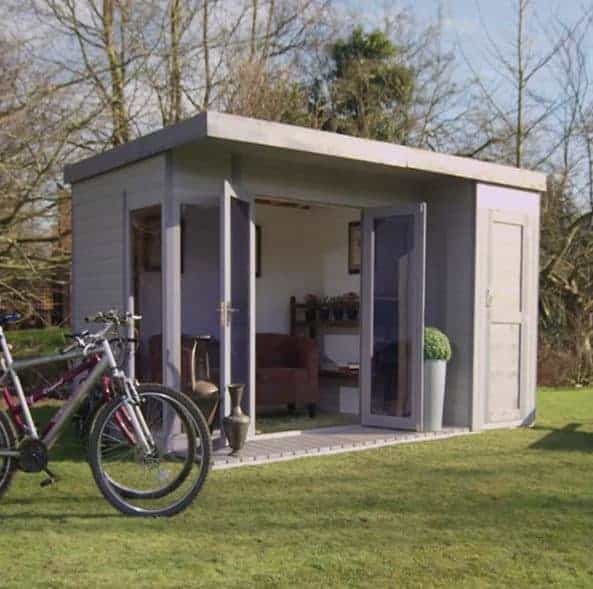 The base width of this summer house is 2.12m and the base depth is 1.48 and yet it’s still possible to fit furniture and electrical equipment inside which would make it a cost effective choice as a home office. We were pleased to see that tongue and groove cladding had been used, as this is very effective at stopping water penetration, but we would have liked it to be thicker than the 7mm used here. The double doors are half glazed, making the glazing the same size as the two adjacent windows. A key operated lock is included as standard, and while we found many positive aspects to this wooden summer house, the lack of an extended warranty period and its relatively thin cladding mean that it occupies a spot towards the foot of our top 20 league table. It may seem strange that at the foot of our top 20 wooden summer houses is one of the most beautiful examples that we’ve seen, but the simple fact is that even though we were delighted with its striking looks the expensive price tag and lack of a long extended warranty stopped it climbing to a position that it could otherwise have occupied. 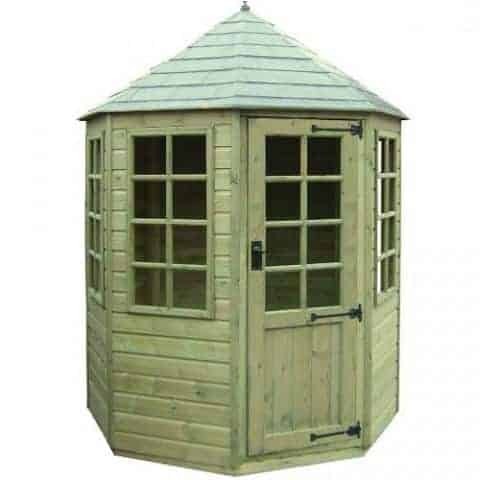 Nevertheless if you like the classic Victorian style of an octagonal summer house, and can afford to spend upward of a thousand pounds for an eight foot by six foot example, then this could be the perfect garden building for you. We found the double doors at the front particularly striking, as they’re glazed from top to bottom in a Georgian style which is also found on the four opening windows on adjacent sides. The glazing itself consists of toughened glass, which will be very welcome if you’re likely to have young children playing in and around it. A dip treatment has been applied to the tongue and groove cladding by the manufacturer, but this doesn’t provide a long lasting protection and so the onus will be on the customer to provide this in future years. The apex roof reaches quite high at 2.56m, but bear in mind that the base width of 2.48m and base depth of 1.95m are both effectively cut down by the use of eight sides. This is, however, a very good looking wooden summer house, and deserving of its place in our top 20.